Xanthan Gum, Pack Size: 25 Kgs. We are a unique entity in the industry, actively committed to offering an optimum quality range of Xanthan Gum. Pack Size: 25 kg / as per req. 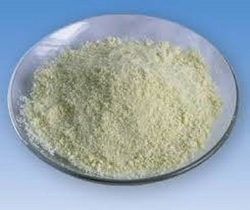 We are a unique name in the market to provide our respected customers an exclusive range of Xanthan Gum Powder. Xanthan gum is a common food additive that you find in everything from sauces and dressings to ice cream and yogurt and, of course, gluten-free baked goods. In most cases, it's used as a thickening agent, or as a stabilizer to prevent separation ofingredients(like yogurt). Xanthan Gum (imported) for food grade. We are a unique name in the market to provide our honourable customers an exclusive range of Xanthan Gum. Xanthan gums function as hydrophilic colloids to thicken and stabilize emulsions, foams and suspensions. This unique combination of properties allows xanthan gum products to perform beyond the limits of many other commercially available hydrocolloids.